This monograph engages the long-running controversy about the origin of the state. 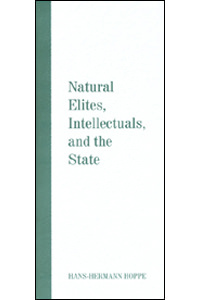 Hoppe adopts the theory that extends from a Rothbardian view of the role of elites in society and their monopolistic tendencies. He further maps out a strategy for how the non-state-connected natural elites can turn back the tide of state-connected elites. It is a seminal contribution to the literature with a hopeful roadmap for the future. from OH Spend the three bucks and get it! I purchased this along with Human Action by Mises and Rothbard&amp;#39;s Power and Market (both Scholar&amp;#39;s Edition, of course). I decided this would be a good investment, since I&amp;#39;ve just started to explore Hoppe&amp;#39;s writing after reading a summary of his Argumentation ethic, which, as far as I can tell, is truly what Rothbard called it: a dazzling breakthrough. I received my books tonight and finished Hoppe&amp;#39;s 23 page pamphlet just minutes before the writing of this review. I think you really ought to give this pamphlet a read, because it is truly elucidating. I won&amp;#39;t go into detail; just know that Hoppe is a gifted, persuasive writer and you will feel so grateful for the things he has brought to your attention. I know I am.